In this exercise we are tasked to explore eye contact and expression. That is eye contact with the subject and whether it is off camera or on camera. For this exercise I combined it with one of the main session for the assignment, concentrating on head / torso shots. For most of the shots I used a static tripod moving it around from time to time and varying the focal length a little and lighting.One of the advantages I found that was talking to the subject without having to look through the lens was a lot more comfortable and easier to see and create expression, regardless if this was on or off camera. 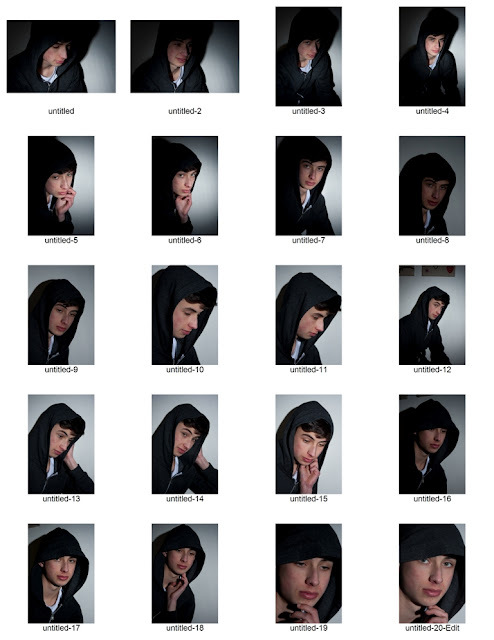 This is definably a more creative way of performing a session that I thought went well. My favourite image of the day was the following. I know that this does not show much of the subject but it has a candid quality to it that is quite warming and unusual. In processing I gave this a high key effect and boosted the contrast.